by: Mary Crossan, Jeffrey Gandz, Gerard Seijts, Gerard Seijts, Jeffrey Gandz, Gerard Seijts, Jeffrey GandzIssues: January / February 2012. Categories: Leadership. The sum of virtues, values and traits equals good character, which, in addition to competence and commitment, is one of the 3 ingredients that make a leader effective and respected. For many, however, virtues, values and traits remain indefinable, even elusive. 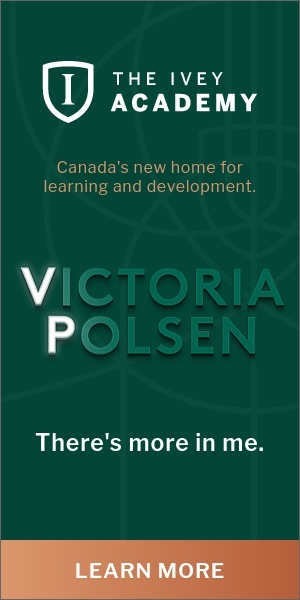 These authors not only define them, they also de-construct them, in the process demonstrating how character fuels people in their personal journeys to become better leaders. Do they have the competencies to be a leader? Do they have the knowledge, the understanding of key concepts, facts, and relationships that they need to do the job effectively? Do they have the commitment to be a leader? Yes, they aspire to be a leader, but are they prepared to do the hard work of leadership, engage with others in fulfilling the organizational mission, achieve the vision and deliver on the goals? Do they have the character to be a good leader and strive to be an even better one? Do they have the values, traits and virtues that others – shareholders, employees, customers, suppliers, regulators and the broader society within which they operate – will use to determine if they are good leaders? We have documented previously the types of knowledge, skills, understanding and judgment that leaders need, grouping them into four competencies – strategic, business, organizational and people. 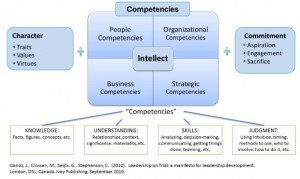 Underpinning these competencies is general intellect (see Figure 1). We have also talked elsewhere about the importance of leaders having the commitment to lead and the problems that are caused when people in leadership roles no longer want to do the hard work of leadership and become disengaged from what is happening in the organization, while they still enjoy the status, privileges and perks of office. In this article, we want to focus on leadership character, not because it is necessarily more important than competencies and commitment, but because it is the most difficult to define, measure, assess and develop. Our intent is to define those dimensions of leadership character that are most important in today’s rapidly changing and turbulent business environment, and suggest how character can be developed. In any bookstore you will find dozens of books on leadership style, far fewer on leadership competencies, and fewer still that address leadership character. For some reason we have lost sight of character. Perhaps this is because our educational system and organizations are so competency focused; perhaps because we just don’t know what to think about character; perhaps because character seems such an old-fashioned word; perhaps because we are reluctant to discuss examples of poor character with our colleagues in the workplace, or because we believe we cannot assess character objectively. Yet character is such a central, important element of leadership — particularly for the kind of cross-enterprise leadership that is essential in complex, global business organizations — which it should not and cannot be ignored. 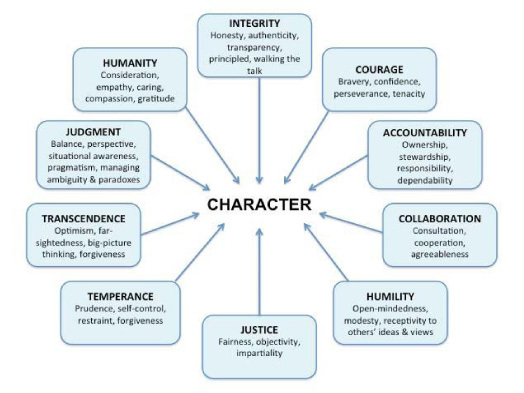 Character fundamentally shapes how we engage the world around us, what we notice, what we reinforce, who we engage in conversation, what we value, what we choose to act on, how we decide…and the list goes on. Our own research on the failures of leadership points to issues around character as a central theme. Nowhere was this more obvious than in the financial crisis of 2008 – 2009, in which boldness or instant gratification triumphed over temperance. People who knew that bad risks were being taken did not have the courage and/or confidence to speak up, and people without integrity sold mortgages to those who could not pay them. They then bundled these mortgages into securities that were fraudulent and sold to others. People with large egos, lacking in humility, oblivious to the harm they may have been be doing to others or the societies in which they operated, became very rich at the expense of millions who were the victims of the financial crisis and subsequent recession. Yet, to this day, these same people seem unable or unwilling to accept any degree of responsibility for their actions. Leaders of large, global companies knew about these types of practices yet did nothing to stop them. Still others were unable to create the honest, transparent corporate culture that would enable them to be in touch with what was happening deep down in the organization. All these behaviors and activities were, essentially, failings of character. There is no consensus on a definition of character. In fact there seems to be as many definitions as there are scholars whose research and writing focus on character. In our discussion of character, we focus on personality traits, values and virtues. Traits are defined as habitual patterns of thought, behavior and emotion that are considered to be relatively stable in individuals across situations and over time. Traits are not fixed. For example, introverts may be able to learn how to behave in a less introverted way, while extroverts may learn how to control and moderate their extroverted behaviors when situations require it. These five traits feature prominently in tests or inventories and they have come to be known as the FFM, or the five-factor model, a robust model of personality. Although the Big Five dominate the personality literature, there are various other traits that warrant consideration and measurement, such as self-confidence, ambition, perfectionism, dominance, rigidity, persistence and impulsivity. Some personality traits can be inherited. For example, studies have shown that identical twins that have the same genes show more traits that are similar than non-identical twins. Traits, of course, also evolve through life experiences and deliberate developmental exercises such as coaching. Values are beliefs that people have about what is important or worthwhile to them. Values influence behavior because people seek more of what they value. If they can get more net value by behaving in certain ways, they will. Values therefore can be seen as the guideposts for behavior. Some people value their autonomy very highly, some value social interaction, some value the opportunity to be creative, some value work-life balance, and so on. Values may change with life stages and according to the extent to which a particular value has already been realized. For example, a new graduate strapped by student loans may value a high starting salary. That same person 30 years later may well pass up a high-paying job for one that paid less, but allowed him to live close to his grandchildren or somewhere with greater access to recreational activities. An individual’s values are in large part derived from the social environment in which he or she lives. In Western democracies, life, liberty and the pursuit of happiness are some of the things we value. Other societies value order, harmony, non-violence and equality. If we are brought up with strong religious traditions, some of us develop values based on the teachings of those religions. Similarly, our value frameworks may be influenced by our home life, fraternal societies we join, experiences obtaining an education, the companies we work for, our friends, and many other social influences. An important sub-set of values consists of those with ethical or social dimensions, such as honesty, integrity, compassion, fairness, charity and social responsibility. Such moral values may be strongly or weakly held and influence behavior accordingly. Values may be espoused though they may not necessarily be manifested. For example, it’s not unusual for people to experience value conflicts in certain situations. When loyalty conflicts with honesty, when fairness conflicts with pragmatism, or when social responsibility conflicts with obligation to shareholders, people become conflicted. And when their actions are inconsistent with their values, they either experience guilt, anger and embarrassment. People try to minimize such cognitive dissonance by rationalizing or even denying their behavior, discounting the consequences of it or simply blaming others. Aristotle identified and defined twelve virtues: Courage, Temperance, Generosity, Magnificence, Magnanimity, Right ambition, Good temper, Friendliness, Truthfulness, Wit, and Justice. The twelfth virtue is Practical Wisdom, which is necessary to live the “good life” and thus achieve happiness or well being. Consider the virtue of Courage. Traits such as openness to experience, self-confidence and persistence contribute to individuals acting in distinctive ways – for example, putting themselves on the line and acting in a courageous fashion. Having values such as integrity, treating individuals with respect and achievement predisposes individuals to demonstrate courageous behavior. Furthermore, a person with integrity tends to act in a different way than a person who lacks integrity, even if both individuals find themselves in the same situation. Then there is a set of actual behaviors that individuals engage in – on a fairly consistent basis (meaning across situations and over time) – and that friends, colleagues and observers characterize or describe as courageous. These behaviors may have become societal expectations. We propose that cross-enterprise leaders who focus on the long-term performance of their organizations must demonstrate ten virtues (as shown in Figure 2). Judgment allows leaders to balance and integrate these virtues in ways that serve the needs of multiple stakeholders in and outside their organizations. 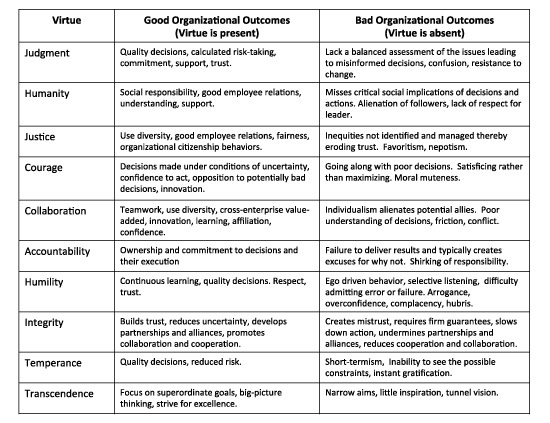 But if you consider what may happen when leaders lack these virtues, the effects become more obvious (see Table 1 below). Without Judgment leaders make flawed decisions, especially when they must act quickly in ambiguous situations, namely when faced with the many paradoxes that confront all leaders from time to time. Without Humanity leaders are unable to relate to others, see situations from their followers’ perspectives or take into account the impact of their decisions on others. Without humanity leaders will not act in socially responsible ways – they will alienate people. Without a Sense of Justice leaders are unable to understand the issues of social inequality and the challenges associated with fairness. Such leaders act in unfair ways and reap negative consequences in the form of poor employee relations or reactions by customers, governments and regulators. People will rebel and find ways to undermine the leader. Without Courage leaders will not stand up to poor decisions made by others and will lack the perseverance and tenacity required to work through difficult issues. They will also back down in the face of adversity and choose the easy route. But in doing so they only postpone the inevitable. Without Collaboration leaders will fail to achieve those worthwhile goals that require more than individual effort and skills. They don’t use the diversity of others’ knowledge, experience, perceptions, judgments and skills to make better decisions and to execute them better. Friction among different stakeholders results and relations deteriorate. Without Accountability leaders don’t commit to, or own, the decisions they make, and cannot get others to do so. They blame others for poor outcomes and in doing so create a culture of fear and disengagement. People stop caring, with potentially disastrous consequences. Without Humility leaders cannot be open-minded, and solicit and consider the views of others. They can’t learn from others, they can’t reflect critically on their failures and become better leaders as a result of those reflections. They become caricatures of themselves. Isolation results. Without Integrity leaders cannot build good relationships with followers, with their organizational superiors, with allies or partners. Every promise has to be guaranteed and the resulting mistrust slows down decisions and actions. Without Temperance leaders take uncalculated risks, rush to judgment, fail to gather relevant facts, have no sense of proportion, and make frequent and damaging changes or even reverse important decisions. Their credibility suffers. Without Transcendence leaders’ goals become narrow and they fail to elevate discussions to higher-order goals. They don’t see the bigger picture and hence their decisions may reflect opportunism only. They don’t think outside the box or encourage others to do so. Aristotle was clear in stating that virtues become vices in their excess or deficiency. Courage in its excess is recklessness while in its deficiency it is cowardice. Collaboration in excess, ungoverned by judgment as to when it will result in benefits, leads to numerous unproductive meetings and organizational inefficiency. But without it, teamwork is difficult or impossible. Too much humility may lead followers to question the leader’s toughness, resulting in a lack of confidence. But without it, leaders make ill-advised decisions and are unable to learn. Transcendence in excess can result in leaders becoming vacuous visionaries, unable to focus on the here and now and the more mundane decisions that need to be made. But without transcendence, leaders focus on narrow, short-term goals. Temperance or Justice in excess may lead to extreme risk aversion and paralysis in decision-making; without them, reckless or grossly unfair decisions are made. Even extreme Accountability may subvert required actions when the penalties for failure are unreasonable or extreme; but without it, empowerment and delegation are not possible. Humanity in excess may lead to the neglect of shareholders’ interests; but in its absence, employee loyalty and commitment will suffer. Judgment under conditions of uncertainty or ambiguity is the essential requirement of organizational leadership; but excessive judgment may lead to indecisiveness or dithering. Even an excess of integrity can lead to self-righteousness and total inflexibility; but organizations could not function without rules and regulations that set boundaries. The challenge for leaders, therefore, is to deepen or strengthen a virtue through reflection, and hence avoid turning a virtue such as Courage into the vice of excess (Recklessness) or a lack of it (Cowardice). Psychologists, sociologists, organizational theorists and others who study behavior in organizations have been interested in traits, values and virtues associated with good leadership. Virtuous leaders are influenced by their traits and values but they balance and integrate them in ways that are appropriate to the situations in which they operate. For example, while leaders may be transparent by nature, they are able to keep a confidence or secret when it is appropriate to do so. While they may be courageous, they will understand which battles to fight and which to avoid. Individuals can develop their own character strengths, leaders can help followers develop their character, and organizations can and should enable character development to take place. Some dimensions of character, specifically some traits, are inherited. Virtues, values and many other traits are developed during early childhood, and modified as a result of education, family influences, early role models, work and social experiences, and other life events. The early philosophers viewed character as something that is formed, subconsciously, through repetitive behavior that is either rewarded or by finding what works through experience. The habit of character is formed along with a myriad of other habits which both enable and constrain us, and that can be both productive and counterproductive. The interesting thing about habits is that we are often unaware of them. There’s a famous saying that illustrates this point rather well – “Watch your thoughts, for they become words. Watch your words, for they become actions. Watch your actions, for they become habits. Watch your habits, for they become character. Watch your character, for it becomes your destiny” (author unknown). As Robert Kegan, a developmental psychologist, said, we need “to resist our tendencies to make right or true that which is merely familiar and wrong or false that which is only strange.” At the core of this capacity is character; hence, character shapes thoughts, words, actions, and so on. Yet, habits may prevent the development of character. For example, a strong ego that has been built to defend one’s identity makes it difficult to develop humility and thus be open to learning experiences. So, when people believe that character is developed at an early age, they are in part correct, since there comes a time when habits are difficult to break. It is not surprising then that it often takes profound life events to liberate us from the cages we have constructed for ourselves. These “crucible” events have a significant influence on the traits and values that are part of character. Some of these events force people to confront the impact of their trait-and value-driven behaviors, and their self-concept of virtuosity. Being fired, having your work praised or criticized, being passed over for a promotion or being promoted when you didn’t think you were ready for it, finding yourself disadvantaged through a boss’s unfair assessment, or being accused of harassment, plagiarism or other forms of unethical behavior are all examples of events that can shape character. Less dramatic but no less important are those events that reinforce good character. The acknowledgement, praise, recognition or reward that come to people for doing the right thing or acting in the right way are critical to character development, especially when offered during an individual’s formative years. Selection for a valued assignment or a promotion further reinforces such behaviors and hence, the development of character. Even normal everyday occurrences offer the opportunity for character development, since it is not something separate from one’s job or life, but rather a part of them. Reflection about why you might be impatient, excessive, stubborn or careless provides the raw material for examining and developing character. There is much that senior leaders in organizations can do to develop leadership character in others. Simply talking about character, making it a legitimate and valued topic of conversation, stimulates discussion and facilitates individual reflection. When organizations develop leadership profiles and address leadership character in those profiles, they emphasize the importance of leadership and promote discussion of it, especially in the context of developmental coaching. Conversely, when leadership profiles only address competencies and commitment, they implicitly, if unintentionally, suggest that character is not important. Even explicit values statements in organizations often turn out to be nothing more than posters or plaques on the wall. Unless they are formulated in the context of the work that people are doing, and in a meaningful way, they tend to be ignored. Anything that senior management attends to is considered important; anything ignored is marginalized. For the most part, people do not learn values and virtues by osmosis. Values need to be addressed explicitly in the organization’s coaching and mentoring, reinforced through training and development, and actively used in recruitment, selection and succession management. Warren Bennis addressed the role of individual responsibility in becoming a better leader when he said: “The leader never lies to himself, especially about himself, knows his flaws as well as his assets, and deals with them directly. You are your own raw material. When you know what you consist of and what you want to make of it, then you can invent yourself.” This is relevant to leadership character as much as it is to competencies and commitment. It requires a degree of self-awareness, a preparedness to examine habitual behaviors and consider whether there may not be better ways of leading than the ones that have worked, more or less, for you in the past. We limit our development as leaders by not having the discipline and courage to assess ourselves honestly. When it comes to leadership, competencies determine what a person can do. Commitment determines what they want to do, and character determines what they will do. Character is foundational for effective decision-making. Clearly, mistakes are made because of a leader’s shortcomings in his or her competencies. More often, the root cause is a failing of character. For example, not recognizing or not willing to admit that you don’t have the requisite competencies to succeed in the leadership role is rooted in character. Not willing to listen to those who can do well because of the perception that it would undermine your leadership is a problem rooted in character. Challenging decisions being made by others but which you feel are wrong requires character. Dealing with discriminatory behaviors by others requires character. Creating a culture of constructive dissent so that others may challenge your decisions without fear of consequences requires character. The question is not really why character matters, but why it does not get the attention and respect it warrants. For character to find the spotlight it deserves, leaders need to illuminate it. We can see some light shed in organizational statements of values and leadership competencies, but the practice is not widespread. We believe organizations should move beyond statements of organizational values to anchor leadership development in profiles that define what makes a leader good, in addition to defining what good leaders do and how they can lead better. Character is not something that you have or don’t have. All of us have character, but the key is the depth of development of each facet of character that enables us to lead in a holistic way. Character is not a light switch that can be turned on and off. There are degrees, and every situation presents a different experience and opportunity to learn and deepen character. In particular, and for better or for worse, character comes to the fore when managing a crisis. No one is perfect when it comes to character, and given that its development is a lifelong journey, we will rise to the occasion in some situations and disappoint ourselves and those around us in others. Numerous examples come to mind where good people do inappropriate things! They get derailed because they stop listening; they become overconfident in their decision-making skills; they become blind to important contextual variables; their emotions hijack their self-control, and so forth. Even good people are fallible. But since we tend to judge ourselves by our intentions and others by their behavior it is easy to become jaded about character. How could someone preach one thing and do another? The point is that in this lifelong journey, we need to appreciate what it takes to develop the habits around character, and to enable the conversations within ourselves and with others that strengthen rather than undermine character. Competencies count, character matters and commitment to the leadership role is critical to the leader’s success. Our experience is that a renewed focus on character sparks the best in people and fuels them in their personal journeys to become better leaders. We see the process of learning to lead as a journey that enables people to bring the best of themselves to support and enable others, ensure that the organizations they work with perform at the highest level, and in doing so, contribute to the society in which they operate. For further information on these leadership competencies see “The cross-enterprise leader” by Mary Crossan, Jeffrey Gandz and Gerard Seijts, Ivey Business Journal, July/August 2008. Titles of books on leadership and character include Questions of character: Illuminating the heart of leadership through literature; The character of leadership: Nine qualities that define great leaders; and Inspiring leadership: Character and ethics matter. For more information see “Leadership on trial: A manifesto for leadership development” by Jeffrey Gandz, Mary Crossan, Gerard Seijts and Carol Stephenson with Daina Mazutis, 2010. http://www.ivey.uwo.ca/research/leadership/research/books-and-reports.htm. This conclusion was reached by Jay Conger and George P. Hollenbeck in a special issue of Consulting Psychology Journal: Practice and Research (2010, 62, 4, 311-316) on defining and measuring character in leadership. Examples of such tests include the Myers-Briggs Type Inventory, the Minnesota Multiphasic Personality Test, the 16 Personality Factors, the Personal Style Indicator and many others. Rokeach, M. (1973). The nature of human values. New York, NY: Free Press. Schwartz, S. (1992). Universals in the content and structure of values: Theoretical advances and empirical tests in 20 countries. Advances in Experimental Social Psychology, 25: 1–66. Our thinking draws heavily on work by Peterson and Seligman “Character strengths and virtues” (2004) who identified six virtues (Wisdom, Transcendence, Humanity, Temperance, Transcendence and Courage) after extensive consideration of traits and behaviors empirically identified among leaders. We have added four others that we feel reflect virtues considered to be important in cross-enterprise leaders (Collaboration, Confidence, Humility and Accountability) and modified Wisdom to the more commonly used Judgment. This follows the argument of Aristotle in the Nicomachean Ethics, Book 3, Chapter 1. While he was describing a limited number of virtues, we believe that his reasoning applies to our extended set. Bennis, Warren (1989). On becoming a leader. New York, NY: Random House Business Books. Jeffrey Gandz is a Professor of Strategic Leadership and Managing Director, Program Design, in Ivey Business School's Executive Development division at Western University. Gerard Seijts is a Professor of Organizational Behaviour, holds the Ian O. Ihnatowycz Chair in Leadership, and is Executive Director of the Ian O. Ihnatowycz Institute for Leadership at the Ivey….